It looks like there's a ride coming up next month to the famous Oxley Highway. For those of you not from Australia the Oxley is one of those great rides for all bike riders. 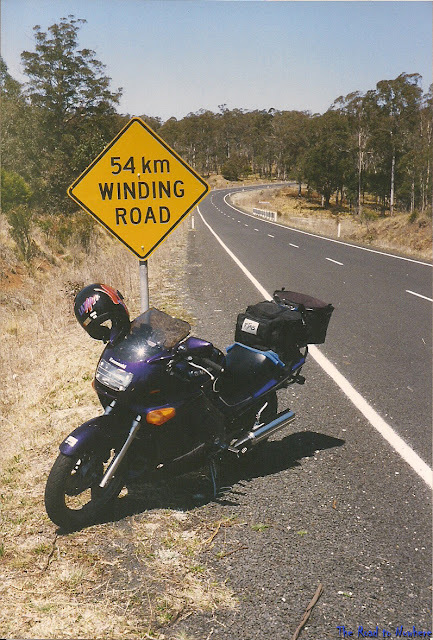 The highlight being 54kms of winding road across the great dividing range. For the Americans it would be something like the tail of the dragon but longer. The dragon is 11miles(18km) but the Oxley has 54km(33mile) of twisties. Just waiting for the guys to sort the date and we are off. I've ordered a new bit of kit for myself, so hopefully that'll turn up before the ride. Now just ticking down the time for the ride. 1 month to go. I haven't been to the Oxley Highway since about 2005 or 2006 when I first went with Geoff and I'm really looking forward to it. It has been so long. I don't know why as its only about 430km away and I've recently done 700km ride in one day. Should be easy, really. Here's a pic from my first ever ride up the Oxley back in 1994. I also note that its one of the only pics I have on this road and I've been up there 4 or 5 times. Nice location for upcoming road trip, best luck for your next ride. 33 miles of twisty roads! That sounds like a great road trip. I've done 200 miles for a 10 mile bit of curvy road. This time you'll have to take more pictures. Thats a long ride to get to some twisty bits, I've done the same sort of thing myself. Its just something that us bikers do I guess. Sounds great, I am looking forward to pics. So.....what is the new bit of kit you ordered? 54 km of twisty fun. Maybe ride there and back to get some more pictures from along the way. 54kms of bliss. I just wish I lived a bit closer to this road so I could ride it more often.